At the GFW19, the geospatial industry, community, and professions find common ground to promote geo-business, to showcase innovation, and to collaborate to seek solutions for global issues. I’d like to emphasize the word “forum.” The Geospatial World Forum 2019 (GWF2019), held in April in Amsterdam, holds a special distinction and role in the global geospatial community mainly for what it is not. GWF is not an end-user conference (like the brand-centric global user conferences, e.g. HxGN, Trimble Dimensions, Esri UC, Bentley Systems Year in Infrastructure, etc. ), yet there were numerous presentations of outstanding applications and projects befitting the theme and focus of the forum. GWF is not a product/trade exhibition (like INTERGEO, Bauma, CONEXPO, etc. ), yet there was a substantial exhibit hall of emerging and established technologies, solutions, public and private organizations and advocacy groups—again befitting the theme and focus of the forum. What GWF brings to the world of geospatial is the opportunity of high-level dialogue, networking, and collaboration that is essential in solving global issues and growing the geospatial industry. While the large commercial user conferences and exhibitions dwarf GWF in attendance, they focus more on end-user constituencies, while GWF takes on the role and flavor of a more executive-level event. This is not to say that geospatial practitioners and professionals should not attend GWF; on the contrary, I’d strongly encourage more of our ranks to attend. If there is any event that could inspire you by showcasing how important the work we do is and highlight the problems we solve, GWF should be on your list. For surveyors, that list should also include an annual FIG (International Federation of Surveyors) event. Many of our readers who are involved in surveying, geomatics, civil engineering and construction (AEC) might see the word “geospatial” and think “GIS.” No, GWF has always included all of these fields, for this growing world of “reality capture” is not possible without those who capture and assure the quality of the masses of geospatial data. And we will not see full implementation of digital construction and BIM without those who apply the spatial design data to the field. You are highly appreciated by the “geospatial” folks, and this year’s GWF brought the issues of global infrastructure and AEC to the fore, from the keynote speeches to dedicated session tracks. xyHt was honored to be asked to moderate a track on digital construction (more on the included sessions below). The geospatial community produces a lot of data—huge amounts—and this rapidly growing mass of geospatial data is not only valuable but essential in fostering sustainable growth of infrastructure. Esri president and chairman of the recently formed World Geospatial Industry Council (WGIC), Jack Dangermond, said in his keynote address (entitled “Empowering Billions”) and in subsequent sessions that we have moved past just the data and need to move more towards advocacy: advocacy in how the geospatial community can raise awareness of this growing and dynamic wealth of geodata and in how to promote best practices to optimize the use thereof in solving pressing global issues. Trimble CEO and president Steve Berglund gives his keynote address on collaborative workflows. AEC took center stage in the second keynote: Trimble president and CEO Steve Berglund spoke on collaborative workflows and enabling technologies that have brought a new era of BIM, designing for constructability, construction automation, and how such model-based workflows can foster greater efficiencies in operations and asset management. All of this was underscored by the same critical needs also emphasized in multiple sessions (including the digital construction panel moderated by xyHt): that legacy tools and methods will not meet the growing demands for infrastructure—smarter, greener, more cost-effective and sustainable infrastructure. The population of the world has doubled in our lifetimes, yet we are still hobbled by legacy inefficiencies in key sectors. A point raised in many of the sessions and keynote addresses was that AEC has been invited to the table, and we need to step up and implement solutions. Announced less than a year ago at the United Nations Committee of Experts on Global Geospatial Information Management (UN-GGIM), the World Geospatial Industry Council (WGIC) held a board meeting the day prior to GWF2019 with focused collaboration meetings during the event. The WGIC has strong ties to GWF, with many of the key participating companies and organizations also forming the initial board of the council. Sanjay Kumar, CEO of Geospatial Media and Communications (organizer and host of the GWF events worldwide), is also the secretary general of WGIC. Kumar had convened an inaugural meeting of media representatives in attendance at GWF to begin conversations on collaboration on messaging for the geospatial community and council. Note that the council is not just focused on idealistic causes (advocacy for the geospatial industry will of course serve to promote business growth as well). But even so, the sessions and meetings I attended seemed to be focused on sustainable growth goals (SDGs). A term like “sustainable development goals” sounds like something that partisan talking heads might wish to convince you is somehow anti-business and anti-growth. Not at all. In most instances the term, and the stated goals, boil down to a simple proposition: the growth needed to support global demands should be achieved in a manner that can be effectively sustained and operated in the long term, without serious impact on limited resources or irreversible detriment to the natural world. Many people, one small world, responsible growth—there should be nothing controversial about that. GWF has also been host to meetings (and a dedicated conference in 2018) for an ongoing initiative called Geo4SDGs. A geospatial leadership panel for media featuring (from the left): Massimo Comparini, CEO e-Geos; Frank Pauli, CEO CycloMedia Technology; Ron Bisio, senior vice president, Geospatial, Trimble; and Esri president and CEO, Jack Dangermond. The WGIC invited representatives from several major global organizations and councils to attend and discuss collaboration. An example is the International Telecommunications Union (ITU, an organization that has since announced a partnership with the WGIC). The World Energy Council discussed the use of geospatial data in their research and activities, including a briefing on their 2019 Global Energy Scenarios Comparison report. These name just a few. There were sessions and tracks on Geo4Environment, big data, regional forums (India, Africa, Middle East, etc. 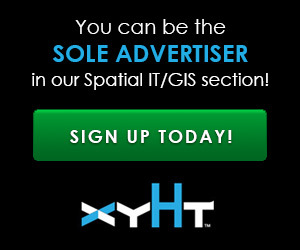 ), location analytics, and business intelligence, and more. But of direct interest for our readers is the prominent focus on infrastructure and construction. Trimble’s Ron Bisio presented his reflections on the digital collaboration innovation applied to the construction of one of their new corporate office buildings, and Hexagon’s president of their construction tools division, Katherine Broder, addressed the oft-overlooked challenges of the mapping of underground utilities and features. It was heartening to see that a full subsequent panel was dedicated to underground matters. We hear a lot about reality capture, digital twins, et al.—the above ground is relatively easy to capture—but in many ways what is under the ground is the final frontier. We’ll be publishing a lot on this subject moving forward. Among the numerous annual awards presented at GWF was one for geospatial ambassadorship, this year going to a tireless advocate for geo-outreach particularly in the field geospatial intelligence: Keith Masback, former president, USGIF, owner and principal consultant, PLUM RUN LLC. Keith is someone great to follow on twitter: @geointer (he’d be a great speaker at state survey and geo conferences). We were also introduced to the dynamic geo-entrepreneur, Alexis Hannah Smith, founder and CEO of IMGeospatial, a firm that creates automated business products based on machine learning, artificial intelligence, automatic feature extraction, remote-sensing, and multi-scopic data, providing valuable geospatial insights for many industry sectors. IMGeospatial was recognized as the startup of the year and has been invited to join the WGIC (we will publish a company profile soon). The geospatial woman champion of the year went to Ingrid Vanden Berghe, director of the NGI (National Mapping Agency of Belgium), and the Bill and Melinda Gates Foundation was recognized with the Making a Difference award. A royal honor was bestowed to one of the most influential figures in the geospatial community, Esri president Jack Dangermond. During the GWF week, the mayor of Zaandam (a city near Amsterdam where the event was held) bestowed this on Jack on behalf of Netherlands King Willem-Alexander. He was appointed Officer in the Order of Orange-Nassau: one of the highest civilian honors. Dangermond, whose parents emigrated from the Netherlands, has been recognized not only for his contributions to GIS, but also for his advocacy for a great many causes. This honor is in some ways the equivalent of a knighthood. Congratulations Sir Jack! The city of Zaandam (near Amsterdam) and the venue of GWF2019 is a real-world example of innovation in sustainable development. Geospatial Media’s Sanjay Kumar and co-host Dorine Burmanje, chair of the executive board of Kadaster, announced jointly by that GWF 2020 will convene again in Zaandam (near Amsterdam) at the same venue in April of 2020. The WGIC will also hold board meetings, outreach, and collaboration sessions there. The Netherlands is a logical and appropriate location for such an event as a major global air route hub and an epicenter of tremendous activity and innovation in geospatial (and infrastructure) development. If there were any country that has taken the mantle of geospatial innovation and the combining of geo+BIM, while preserving the green and attracting business and sustainable development, the Netherlands is among the leaders—if not the clear leader. What you do as surveying, engineering, and geospatial professionals is making an impact. And while we concentrate on making the world a better place—one story map, construction site, 3D model, or survey stake at a time—we are all involved in these endeavors. Come and join in the dialogue in Amsterdam next year … the GWF has plenty of room at the table.